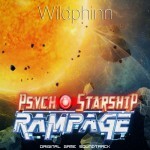 Wildphinn » Psycho Starship Rampage has been greenlit! Psycho Starship Rampage has been greenlit! Psycho Starship Rampage has been greenlit, meaning the game will be sold on Steam, the most important videogame online store. A lot depended on that and you folks have been awesome in trying the game out, giving feedback, spreading the word and supporting the project! So the game is still scheduled for autumn, which means… that I might very well release an album of the soundtrack around that same date. Stay tuned. And you can still try the demo out on itch.io! Psycho Starship Rampage NEW and UPDATED trailer !